The Peace Center's address is 300 S. Main Street, Greenville, SC 29601. The building sits on the corner of Main Street and Broad Street in Downtown Greenville. Please follow the link for more information regarding Directions and Parking near the Peace Center. 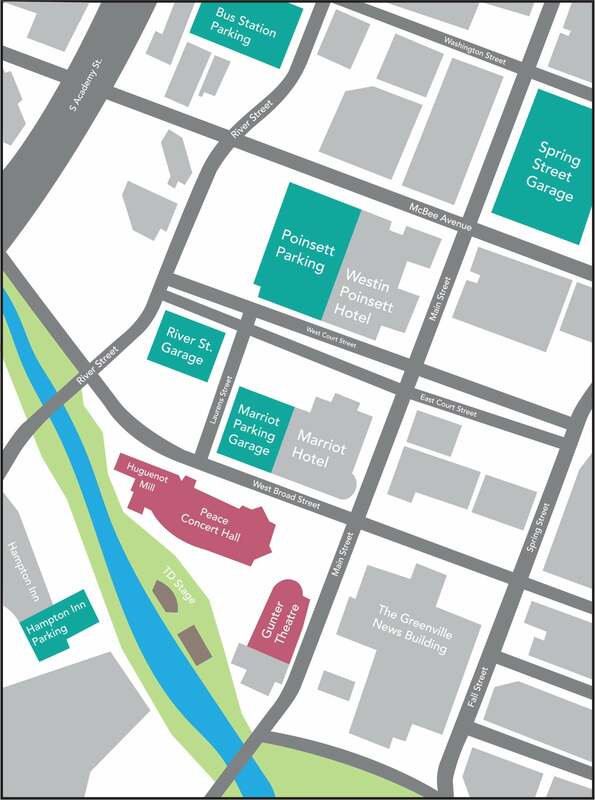 View a map of the Peace Center and nearby parking garages. The Peace Center is centrally located in Downtown Greenville. There are many hotels in the vicinity that are within walking or driving distance. For additional information regarding accomodations please call our Box Office at 864.467.3000 to speak to a Customer Service Representative. For additional information, accommodation suggestions, or to speak with one of our customer service representatives, please call the Box Office at 864.467.3000 or visit our Frequently Asked Questions.